The 5+1 nuclear negotiations will resume in November. Although this is still some time away, analysts, policy writers and diplomats have been busy working to formulate an achievable diplomatic position which will bridge the gaps left at the end of the last session. Here in the UK, we think we know what our position must be. Iran must make concessions on the number of its centrifuges and in exchange sanctions will be lifted within a reasonable time scale. In this respect, the UK falls broadly in line with the American position. But with the opening of the 69th Session of the UN General Assembly next week, and the second visit to New York of Iran's President Rohani, perhaps this is a good time for the UK to step back and consider exactly what that American position actually is. A side-meeting on September 18 in New York will test the waters on progress. Iran is not optimistic. This time last year, western powers pinned great hopes on newly elected President Rohani after the painful and acrimonious Ahmadinejad years. President Obama's unprecedented personal phone call to him was widely welcomed as a parting gesture of goodwill. But when Rohani arrives in New York this time there will certainly be no roses strewn across his path. America's tone this time will be significantly different; if not overtly hostile, it is still, conspicuously chilly. Evidence for this comes not in words -- the official America line is that diplomacy must be given a chance to succeed -- but specific anti-Iran activity clearly demonstrate a truer U.S. position which still engenders ostracism and enmity rather than engagement and diplomacy. But the main indication of bad faith on the American side came when, in spite of widespread warnings and criticism, Congress voted to impose even more sanctions on Iran in the gap between negotiating sessions without waiting for a proper assessment of Iranian compliance with its agreed obligations. Congress argued that since sanctions forced Iran to the negotiating table, this would add leverage to the U.S. position. But there was no evidence of this. Critics pointed out that Saddam Hussein's regime survived for years under sanctions and only a disastrous war and occupation deposed him. Iran has been under American sanctions for 30 years. What did Congress hope to achieve by adding more? The only interpretation for many was that Congress acted deliberately to provoke Iran to walk away from the nuclear negotiating table. Iran's interpretation, which is just as valid as an American view, was that America can only engage in diplomatic relations if its intention is to make concessions as well as extract them from Iran. Iran sees no evidence of this. President Obama is unable to lift sanctions imposed by Congress and clearly a bellicose Congress will not vote to lift sanctions. Indeed one Iranian lawmaker characterized the fresh sanctions as "punishing Iran because Israel lost in Gaza" when Operation Protective Edge achieved none of Prime Minister Netanyahu's self-imposed objectives. Now that Iran and Russia have agreed to strengthen energy ties and are looking to create a payment system outside the hegemony of the U.S. dollar, America is slowly waking up to a shifting power balance, arguably of its own making, which signals increasing evasion of the U.S. sanctions regime by countries seeking the economic advantages attached to trading with Iran. Even apart from the problems of Ukraine, Russian and Chinese trade imperatives are unpicking the unity of the P5+1. Obama's National Security Advisor Susan Rice just traveled to China at his behest to strengthen relations. Germany and France are also weighing the potential economic losses and gains that are imposed on them by the sanctions regime, and may also drift further from the U.S., UK and the silent partner of both, Israel. Iran has been under sanctions for 30 years but the economy is growing stronger. From a western perspective the Middle East is chaotic and is reaching crisis point with the advent of ISIL. 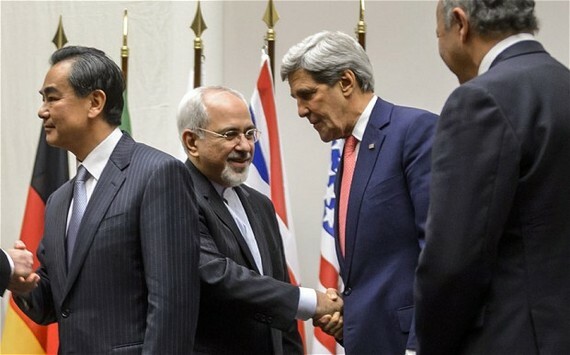 But Iran now enjoys growing influence in the region through the exercise of soft power. Hamas leaders in Gaza are accepting a more political role and have agreed to work with Fatah to create a new Palestinian Authority. Hezbollah has successfully carved out a leading role in the government of Lebanon. This is where we see the hand of Iran. Iraq, Afghanistan, Kurdistan and Syria draw ever closer to Iran not only as a natural, but more importantly in the light of perceived American double-standards, as a reliable ally. Iran's latest use of this influence was used to successfully help Iraqi Shiite militia oust ISIS from various locations in north Iraq. If America's Iran policy was designed to weaken and isolate the country, it has failed. It is, however, now possible to state that if Israel, with or without the backing of the United States, could have launched a pre-emptive air strike to take out Iran's nuclear infrastructure, then it would have done so by now. The truth is, not only does Iran's military capability render it a daunting foe, but its retaliatory capability would strike deep into American interests in the Middle East. In 2013, Iran successfully guided down an American drone which was then reverse engineered to create a home made version. Only in August, Iran claimed, controversially, that it had shot down an Israeli drone before it left Iranian airspace after it had been tracked flying near the Natanz nuclear power plant. Also in August, Iran's Defense Minister Brigadier General Hossein Dehqan, announced that the supersonic Khalij-e Fars (Persian Gulf) ballistic missile has gone into production. Although Iran describes this as a defensive weapon, the Pentagon is reportedly concerned about Iran's reach into the Persian Gulf where U.S. warships would be vulnerable. The crisis in northern Iraq must prove a salutary lesson. That Iran can wield soft power in Iraq does not need stating, but that Iran is willing to work in military cooperation with America where they have mutual interests and benefits has been swept under the carpet by ideologues refusing to "give in" to the Iranians. Instead Senator Kerry is off to visit Jordan, whose own citizens threaten turmoil over recent events in Gaza, and Saudi Arabia, whose Wahhabi reach into Iraq amounts to at best an irritant to the majority of Shiites and Kurds, and at worst, amounts to support for IS. Excluding Iran and focusing on Syria only reinforces the perception that this will essentially be an anti-Iran coalition. But the price will be paid not by Iran but the weak Gulf states and western countries where the terrorists may turn next. Acknowledging this doesn't mean we have to like it and it certainly doesn't mean that the west shouldn't drive a hard bargain over Iran's nuclear ambitions. But it does mean that America needs to rethink its obdurate resistance to this new reality and accept that if it can't wage war against Iran it will need to engage with the Islamic Republic as is, in the here and now. The days of war and regime change bluster have reached the end of the road.